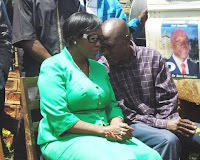 Monday February 8, 2019 - Narc Kenya chairperson, Martha Karua, has castigated former Kakamega Senator, Boni Khalwale, for opposing a court ruling which gave married women the nod to inherit their father's estate. In a landmark ruling on Tuesday, the Environmental Court in Nyeri allowed women to inherit their father’s land. Justice Lucy Waithaka observed that the law of succession, unlike customary law and many African traditions, gave married daughters the right to inherit and own property of their father's. However, in a fierce statement, Khalwale opposed the ruling saying this will disrupt harmony in families because it was contrary to many communities' cultural practices. Khalwale said in Luhya community a woman is only entitled to inherit her father's estate if only born without a brother. "Culture guarantees harmony in families and keeps good public order. •Women born without a brother inherit entire father’s land •Not even an inch for married women •Divorcees are returned for burial by former husbands •Single women are buried on the hedge •Barren man sells his land," the Senator said. But, Karua, who was among those who celebrated the ruling, rubbished Khalwale’s statement and accused him of 'stone age reasoning' for supporting practices which are not founded in the law. “Stone age reasoning not worthy of a leader, a former lawmaker who is deemed to know the law," Karua said.